12-Turn-13 has played host to Mister Saturday Night on two occasions and both have been some of the most special parties we’ve thrown. The first time, Kenny Dixon, Jr. stopped the music, and held one of his beloved records in the air and proudly declared, “See this? This is is VINYL. 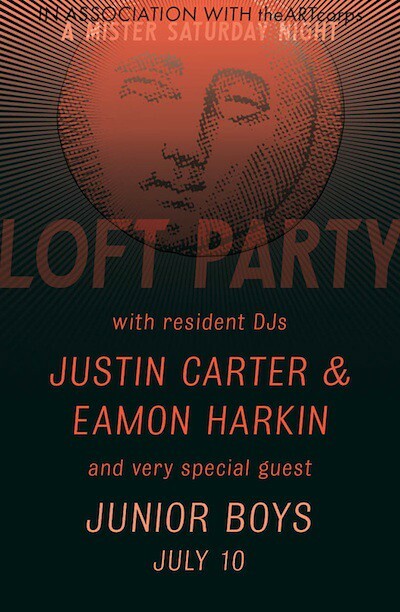 I brought this sh*t on the motherf#$king plane!” Then back in February, Justin and Eamon played two of their most well received sets to a packed house alongside a graceful performance from the one and only Larry Heard. Well, this Saturday we’re back and we think it’s going to be another special one. The usual team are on board to make it feel like home. As always the DJ booth is set up in the kitchen on top of the stove; the dancefloor will will be surrounded by our favorite soundsystem; and the roof, which will come in especially handy on this warm (but much, much cooler than it’s been) July evening, will be available so there’s plenty of room to chat, cool off and wander under the stars. Once again we’ve got a special guest on board for the evening — Jeremy Greenspan of Junior Boys. This isn’t just a celebrity set from a band you love, though. Jeremy is a bona fide disc jockey, having released a top-notch mix CD on Get Physical a couple years back and spending plenty of time around the world mixing records. Sounds like a good time to us… We’ll see you then. CAN NOT WAIT! LAST WEEK WAS AMAZING! !